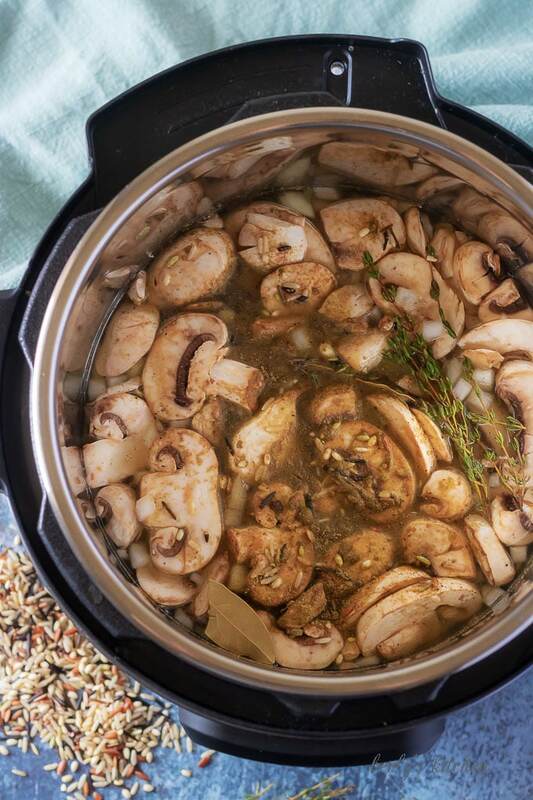 This instant pot soup features celery, garlic, onions, mushrooms, and wild rice. It’s a comfort food sure to keep you warm on a chilly Fall afternoon. The last couple of days we’ve been getting hit with thunderstorms. Which is great because the showers have been keeping the temperatures nice and cool. It’s a welcomed change after the last months of scorching heat. Furthermore, it’s a reminder that Fall is just around the corner for us here the United States. Keeping that in mind, Kim and I decided to share her latest Instant Pot soup. 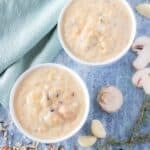 As you can see form the photos, it’s a creamy vegetable dish loaded with everything you need to make a delicious soup. Including the foundation of any great savory recipe, carrots, celery, and onion. 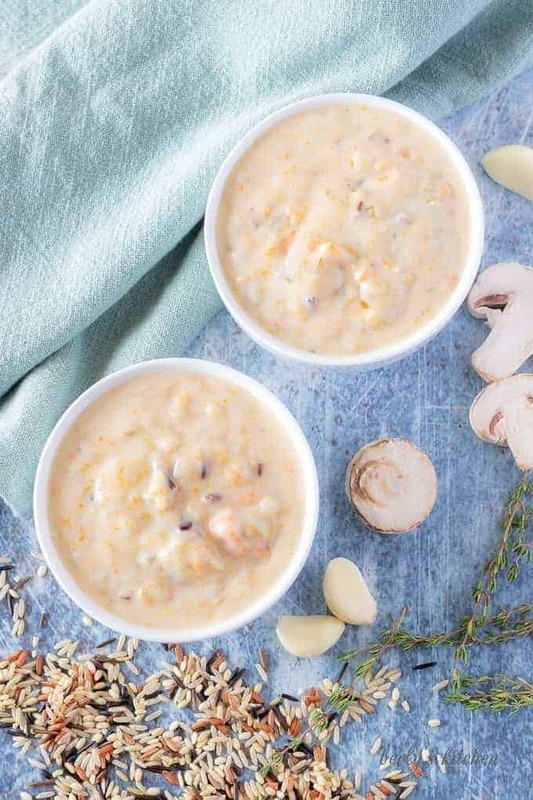 The fabled trinity of gourmet cooking make this Instant Pot soup a must-try no matter your experience in the kitchen. I could talk about it all day, but let’s just get down to business. As always, you can find tips for the recipe just above the recipe card. First, start by placing all soup ingredients into the Instant Pot, making sure to pour the rice on top. If the rice is on the bottom, it will stick and burn. The roux ingredients are not included in this step as it is prepared separately on your stove-top. Next, use a spoon or spatula to press down the rice so it’s submerged in the broth. If you don’t submerge the rice, it will not cook properly in the Instant Pot. Remember, nobody likes poorly cooked rice. Then, choose the manual pressure/pressure cook option setting for 35 minutes. After the cook time is finished, allow the Instant Pot to complete a 10 minute natural release before opening the valve for a quick release. We would not recommend using a quick release right away because this is high-starch dish that needs time to soak up the flavorful broth. Also, if you use a quick release, there’s a chance the steam will spray a thick starchy liquid all over your kitchen. Not fun times to clean-up. Now, while the soup cooks, make the roux. Melt the butter in a medium-sized saucepan, then add the flour. Whisk constantly to incorporate the flour and make a smooth consistency. The longer the roux cooks, the darker in color it will become. Additionally, the longer a roux cooks, the less “thickening power,” it has when mixed with the soup. Cook for about 5-7 minutes, just long enough to eliminate the raw flour taste. To finish the roux, add the milk and whisk everything to combine all the ingredients. Once your done, remove the pan from the heat and set the roux aside. Last, with the soup finished in the Instant Pot, carefully add the roux. Stir the instant pot soup to combine everything and remove the bay leaves and thyme stems. 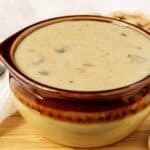 The soup should thicken and have a creamy texture. That’s it, serve and enjoy! Not feeling the roux, that’s fine, just make a corn starch slurry and use that to thicken the soup instead of the roux. However, the soup will not have the same color and texture. The soup is really thick after it cools. It’s best to heat it over low heat over the stove and add some milk to thin it out. Almond milk or coconut milk can be used to for a dairy free option. 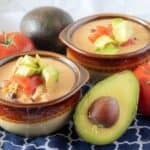 Looking for more interesting soup recipes? 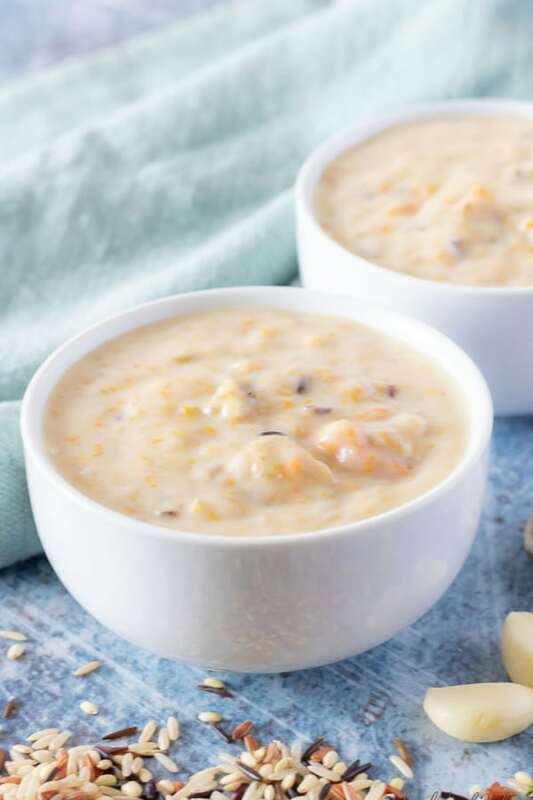 Then check out our Instant Pot Chicken Taco Soup, Easy Holiday Dinner Roll Soup Bowls, or Instant Pot Penne alla Vodka recipe! 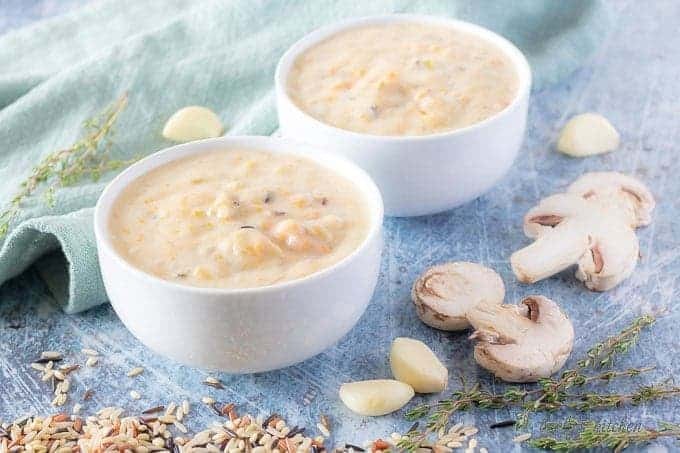 This instant pot soup features celery, garlic, onions, mushrooms, and wild rice. It's a comfort food sure to keep you warm on a chilly Fall afternoon. Step One, place all soup ingredients into the Instant Pot making sure to pour the rice on top. Do NOT add the roux ingredients. Step Two, use a spoon or spatula to press down the rice so it’s submerged in the broth. Step Four, choose the manual pressure/pressure cook option setting for 35 minutes. After the cook time is finished, allow the Instant Pot to complete a 10 minute natural release before opening the valve for a quick release. Step Five, while the soup cooks, make the roux. Melt the butter in a medium-sized saucepan, then add the flour. Whisk constantly to incorporate the flour and make a smooth consistency. The longer the roux cooks, the darker in color it will become. Cook for about 5-7 minutes, just long enough to eliminate the raw flour taste. Step Six, add the milk to the roux and whisk to combine. Remove from heat. Step Seven, after the soup finishes in the Instant Pot, carefully add the roux. Stir to combine and remove the bay leaves and thyme stems. The soup should thicken and have a creamy texture. The calories listed are an approximation based on the ingredients and a serving size of approximately 1-cup. Actual calories will vary. 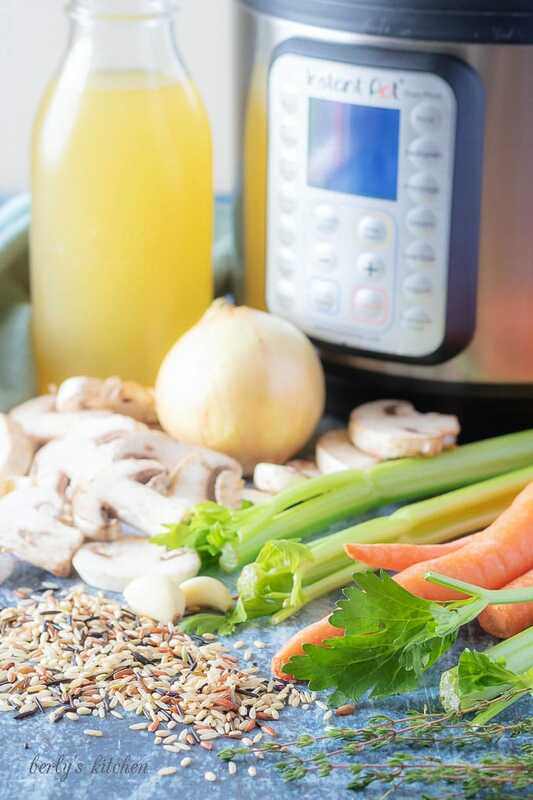 The instant pot soup can be stored in your fridge in a sealed container for up to 3-days. Where do you get wild rice? Do you just use a box of something like Uncle Bens and leave out the seasonings? Good Morning Donna, that’s an excellent question. We use Lundburg’s wild rice blend. Here’s an affiliate link to it on Amazon: https://amzn.to/2vEWOAp Be aware if you use this link and purchase it on Amazon (or any other Amazon product for a limited amount of time), we are compensated for that purchase. With that being said, it was also available at our local Walmart. So, you might be able to find it at your local grocery store. I hope this information helps. If have any other questions, feel free to contact us. Have a lovely Sunday, Donna! Thanks again for responding — can’t wait to try this! Hi! If I wanted to make this a little earlier, would it be good to make the IP part, and then later at dinner time heat it back up, make the roux, and combine? Or is it just good to do it all at once and reheat like you recommended? Thanks!